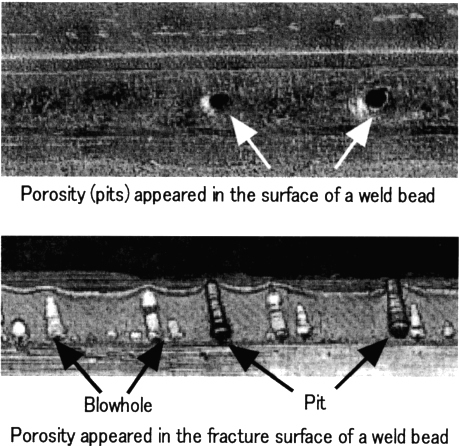 Porosity refers to cavity-type discontinuities or pores formed by gas entrapment during the solidification of molten weld metal. Porosity reduces the strength of a weld. In arc welds, it is caused by dissolved gases that are usually present in a molten weld metal. If the dissolved gases are present in amounts greater than their solubility limits, the excess is forced out of the solution in the form of bubble or gas pockets as the weld metal solidifies. The gases, which may be present in the molten weld pool, include hydrogen, oxygen, nitrogen, carbon monoxide, carbon dioxide, water vapor, hydrogen sulfide, and rarely, argon, and helium. Hydrogen is the major cause of porosity in weld metals. In addition, when the base metal is coated with zinc-bearing primer or is galvanized, zinc vapor can be one of the gases. Porosity is generally spherical but may be cylindrical. Cylindrical or elongated porosity is also referred to as "piping porosity" or "wormhole." Other types are cluster porosity, which is a localized group of pores, and linear porosity, in which a number of pores are aligned. When porosity is seen in the weld face, it is also referred to as "pit.' When porosity is detected, by fracture or radiograph tests, as a sub-surfaced pore that does not extend to the weld face, it is also referred to as "blowhole." 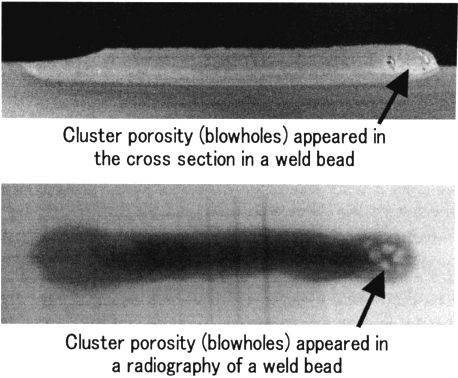 Typical cluster porosity (blowholes) is shown in Figure 1, which was caused by improper arc starting with a low hydrogen type covered electrode. This can happen even if redried before use. In order to prevent this type of porosity, the backstep technique should be used to start the arc. Figure 2 shows typical linear porosity (pits and blowholes), which was caused by the primer coated on the base metal. In order to prevent the detrimental effect of the primer, either the primer should be removed from the fusion surfaces before welding or primer-resistant welding wire should be used. MX-200 is recommended. Misuse of welding processes, mishandling of welding consumables, and base metal surface contaminants cause the occurrence of porosity. Proper welding procedures for a given combination of welding process, base metal and welding consumable should produce welds that are essentially free of porosity. In this sense, the following procedures are essential. 1. Use properly dried welding consumables. 2. Use base metals that are free of contaminants. 3. Maintain welding machines in good condition.